The hypothalamic-pituitary-adrenal (HPA) axis is a complex network of interactions between the hypothalamus, the pituitary and the adrenal glands that regulates things such as temperature, digestion, immune system, mood, sexuality and energy usage – in addition to controlling the body’s reaction to stress and trauma. 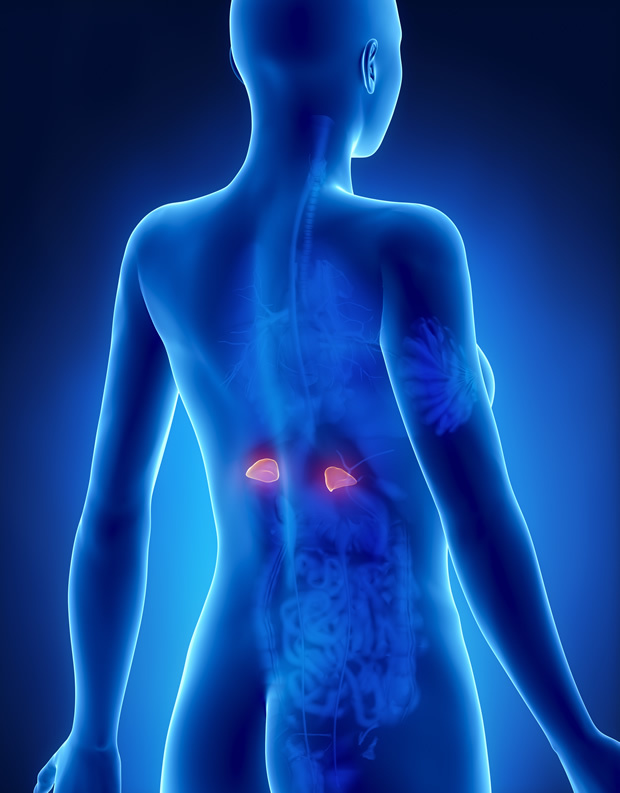 Chronic adrenal stress depresses hypothalamic and pituitary function. Since these two organs direct thyroid hormone production, anything that disrupts the HPA axis will also suppress thyroid function. Studies have shown that the inflammatory cytokines IL-1 beta, IL-6 and TNF-alpha, which are released during the stress response, down-regulate the HPA axis and can reduce levels of thyroid stimulating hormone (TSH). Another study showed that one single injection of tumour necrosis factor alpha (TNF-alpha), reduced serum TSH, T3, free T4, free T3 and hypothalamic TRH for 5 days. TNF-alpha was also found to decrease the conversion of T4 to T3, reduce thyroid hormone uptake, and can also decrease the sensitivity of the thyroid to TSH. 93% of the hormone produced by the thyroid gland is T4. It is inactive in that form and must be converted into T3 before it can be used by the cells. The inflammatory cytokines disrupt the HPA axis and they also interfere with the conversion of T4 to T3. The enzyme 5′-deiodinase catalyses the conversion of T4 into T3. Both Th1 and Th2 inflammatory cytokines have been shown to suppress the conversion of T4 to T3. In healthy patients without thyroid illness, as levels of IL-6 (a marker for inflammation) rise, levels of serum T3 fall. Injections of inflammatory cytokines into healthy human subjects resulted in a rapid reduction of serum T3 and TSH levels, and an increase in the inactive reverse T3 (rT3) form, while T4 and free T4 levels were only minimally changed. The gastrointestinal tract, lungs and the blood-brain barrier are the primary immune barriers in the body. They prevent foreign substances from entering the bloodstream and the brain. Adrenal stress weakens these barriers, weakens the immune system and promotes poor immune system regulation. When these immune barriers are breached, large proteins and other antigens are able to pass into the bloodstream or brain where they do not belong. The immune system can get thrown out of whack and we become more prone to autoimmune diseases – such as Hashimoto’s. Inflammation can depress thyroid receptor site sensitivity and producing hypothyroid symptoms, even though lab markers like TSH, T4 and T3 may be normal. Cortisol is released by the adrenals during the stress response. Chronic stress decreases the liver’s ability to clear excess oestrogens from the blood. Excess oestrogencan increase levels of thyroid binding globulin (TBG), the proteins that thyroid hormone is attached to as it is transported through the body. Thyroid hormone is bound to TBG which is inactive. High levels of TBG can reduce percentage of free thyroid hormones. Aside from adrenal stress, the most common causes of elevated TBG secondary to excess estrogen are birth control pills and oestrogen replacement (i.e. Premarin) and that can disrupt the thyroid function. Adrenal stress is often caused by something else. These causes include the following: anaemia, blood sugar swings, gut inflammation, food intolerances (especially gluten), essential fatty acid deficiencies, environmental toxins, and of course, chronic emotional and psychological stress. High stress levels is an 80% cause of most diseases. If you live a stressful life and have a highly stressful career, start finding ways of reducing your stress levels before it’s too late and fatal diseases comes knocking on your door.